Over the past twelve months we have been developing some new approaches to the challenge of providing rich, revealing interfaces to cultural collections. The key idea here is the notion of generous interfaces - an argument that we can (and should) show more of these collections than the search box normally allows; and that there's a zone between conventional web design and interactive data visualisation, where generous interfaces might happen. There's more on this concept in my NDF 2011 presentation, or (in a more formal mode) in the paper I presented at the recent ICA conference. Here I want to introduce an experimental "generous interface" prototype. 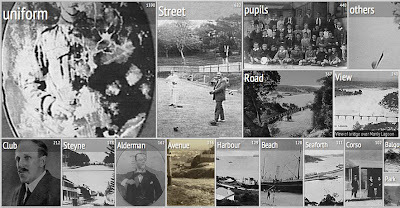 Manly Images is an explorer for the Manly Local Studies Image Library - a collection hosted by the Manly Library. 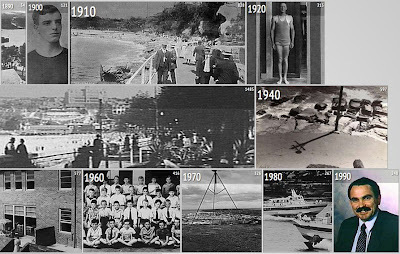 This is a collection of around 7000 images, documenting the history of the Manly region from the 1800s to the 1990s. The aim here was to develop a "generous," exploratory, non-search interface to the collection, delivered in HTML. The original intention here was simply to adapt our CommonsExplorer work into HTML - CommonsExplorer uses a linked combination of thumbnails and title words to provide a dense overview of an image collection. But to "show everything" would mean 7000 elements, a stretch even for modern browsers; and I wanted to experiment with some new approaches to overview which remains the key problem here - a really juicy one. Given 7000 images with titles and little else, how can we provide a compact but revealing representation of the whole collection? Here, the strategy was to break the collection into smaller segments based on either terms in the title, or date, and to draw each segment as a simple HTML div, where the size of the box reflects the number of items in that segment. These segments also act as navigational elements, opening a "slider" type display for browsing through specific records, and finally a lightbox for larger images, with links to canonical URLs on both Trove and the Manly site. As a visualisation, it's a bit like a treemap (without the heirarchy), or a reconfigured histogram. But a collection like this is more than a list of quantities; the texture and character of the images is crucial. So as well as showing quantity, the segments become windows revealing (fragments of) the images inside them in a rolling slideshow. We get a visual core-sample of each segment, revealing the character of that group; and across the collection as a whole, a shifting mosaic that reveals diversity (and consistency), and invites further exploration. An interesting side effect is that it becomes possible to surf through the whole collection without doing a thing; it will (eventually) just roll past. This might not be realistic in a traditional browser context, but that traditional, "sit-forward" user model is not what it used to be - as Marian Dork argues, the leisurely drift of the information flaneur might be more apt. So, a rich exploratory interface to 7000 images, without search, and delivered entirely in HTML; we have shown that it's possible, but is it any good? I'll write up my own evaluation with some technical documentation shortly; meantime, feedback on the prototype is very welcome - and if you are interested in building on it, or adapting it for other collections, the source is up on GitHub. Finally some acknowledgements: this project was funded by the State Library of New South Wales and supported by Cameron Morley and Ellen Forsyth; thanks to John Taggart of Manly Library for permission to use the image collection. The collection data is harvested from the excellent Trove API, developed by the National Library of Australia. It's so lovely to see this come to fruition - your 'generous interface' and 'A search box is a "Yes, what?"' phrases have been repeated a lot over the past year! I'm kind of intrigued by the all-in-one-page treatment of the images. I've been finding myself returning and returning to the Hirshhorn website http://www.hirshhorn.si.edu/ just to play lately: even though trying to find one particular screen drove me a little crazy yesterday, I'm fascinated by this presentation, which is simultaneously shallow and rich, and turns all our tunnels of information architecture on their heads.